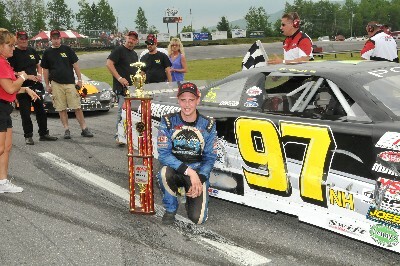 Groveton, NH – Eddie “The Outlaw” MacDonald took the lead from Nick Sweet just past the halfway mark and never looked back en route to his second American-Canadian Tour (ACT) win of the season in the Central Asphalt Paving Generation Next 151 at Groveton, NH’s Speedway 51 on Saturday, June 18. The Rowley, MA driver started seventh and slowly worked his way through the field in the early stages of the caution-free event. 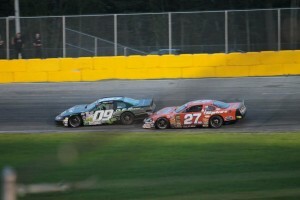 After moving into second place on lap 66 following an extended battle with polesitter Brandon Atkins, MacDonald needed just eight laps to reel in Sweet. He moved to the outside groove a few laps later, assuming the top spot on lap 78 and cruising to his first ACT win at the ¼-mile oval. GROVETON, NH – Jeremy Davis used the outside groove to pass Wayne Helliwell, Jr. and power his way to Victory Lane in the Granite State Pro Stock Series at Speedway 51. Helliwell, Jr. seemed to be the car to beat early, as the two-time American-Canadian Tour (ACT) champion shot out to a commanding lead. Jeremy Davis jumped to the second spot, and began to run Helliwell, Jr. down, before the first of ten cautions brought the field back together on lap 37. Helliwell, Jr. would fend Davis off on the first restart, but Davis would hold his own on the outside groove after a restart on lap 67. Barry Gray would slow in turn one and two bringing out the caution, just before Helliwell, Jr. and Davis would tangle, leaving Davis sideways in the infield. With Gray being the caution car, Davis and Helliwell, Jr. would get their spots back, setting up another battle. GROVETON, NH – Tracy Gordon will be back behind the wheel of a Pro Stock this weekend, as the Granite State Pro Stock Series travels to Speedway 51 (NH), on July 4. The twelve-time K&N Pro Series East feature winner will pilot the Alphacon/WDW Machine ride, normally driven by Matt Frahm. JAMES RIVER, NS (August 15, 2014) – Mother Nature is not cooperating with the running of the Ron MacGillivray Chev Olds GMC 150 at Riverside International Speedway. For the third time this year the event has had to be postponed due to a rainy forecast. Originally rained out June 14 and then June 15, the event was moved to tonight and now to Sunday afternoon. 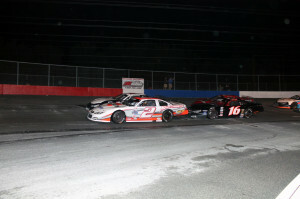 GSPSS Point battle heats up heading into Riverside! On Saturday night September 7th, the Granite State Pro Stock Series will invade the high banked ¼ mile of the Riverside Speedway in Groveton NH. This will mark the first visit to Riverside for the GSPSS. “We are looking forward to bringing Pro Stock/Super Late Model racing back to Riverside”, stated series president Mike Parks A limited number of teams have turned laps on the ¼ mile but all and all it will be a first for 90% of the teams. 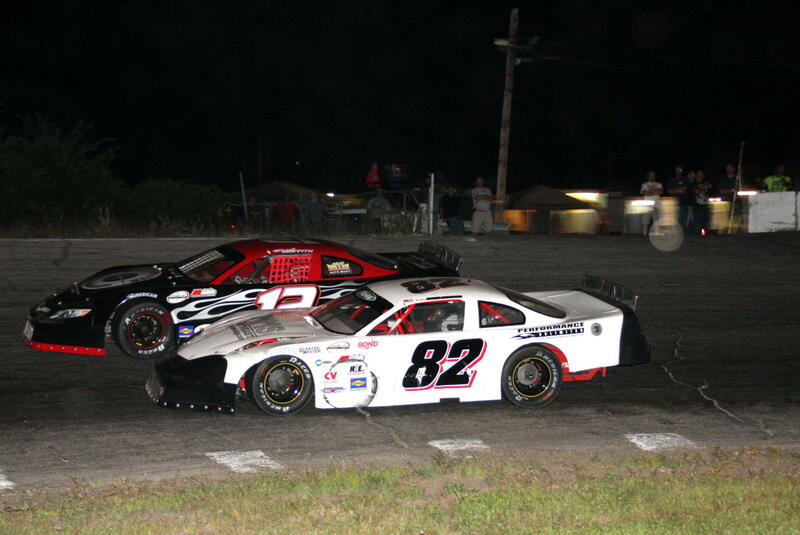 Current point leader Jeremy Davis hopes to turn his recent string of bad luck around, Davis holds a slim 7 point lead over defending Thompson Speedway champion Mike O’Sullivan. As with Davis, O’Sullivan has struggled over the last couple of events. Third place point man Matt Frahm has been on a roll over the last few events and has turned the most laps on the ¼ mile oval, Frahm is one of the favorites for the event. Rounding out the top 5 in the point standings is former Oxford 250 champion Larry Gelinas and longtime Pro Stock competitor Mike Parks. Groveton, NH – Hudson, NH’s Joey Polewarczyk, Jr., grabbed his second straight American Canadian Tour victory in the ACT 150 at Groveton, NH’s Riverside Speedway on Sunday, June 23, beating reigning Champion Wayne Helliwell, Jr., and sophomore driver Jimmy Hebert.